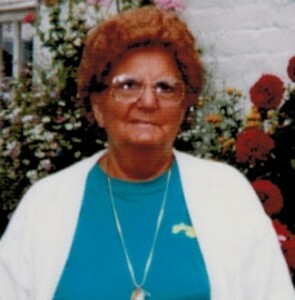 Charlotte P. Zarnick, 84, of N. Warren, PA. died Sunday, August 12, 2012 surrounded by her family. She was born August 2, 1928 in Nebraska, Forest County, PA. to the late Paul M. and Ernestine Catlin Peters. She has resided in Warren most of her life. Charlotte had been owner and operator of the former Liberty Restaurant for about 45 years and had worked at the former North American Phillips as a raw material expeditor retiring in 1984. She was a member of St. Joseph Church, North Warren Fire Dept. Ladies Auxiliary, Multiple Sclerosis Organization at the Rouse Warren County Home. She was an avid New York Mets, Buffalo Bills, Penn State Football and all around sports fan. She enjoyed her trips to Las Vegas, playing cards, champagne brunches. She is known as the Irish Meatball Queen and is famous for her meatballs and meatball soup. Her family, especially her grandchildren meant the world to her. She is survived by 5 Children – Robert Guiffre and his wife, Dawn of Warren, PA., Carol Hinderliter and husband, Carl of Greenville, PA., Pamela Main and husband, Robert of Warren, PA., Judy Gautier and husband, Roger of Hackberry, CO., Mary Jo Gautier of Hillsboro, N.H., 18 Grandchildren, 11 Great Grandchildren, several nieces and nephews. In addition to her parents, she was preceded in death by her husband, Joseph F. Zarnick whom she married October 4, 1979, 1 Son – Samuel Guiffre, Jr., 1 Daughter; – Christina Bauschard, a aunt and uncle, Florence & Ward Dolloff who helped raise her, 1 Brother – Charles Alcorn, 1 Sister – Blanche McGregor. I am so sorry to learn of your Mother’s passing, I knew her from the Auxilllary at the fire hall, I will especially remember her for her wonderful smile, and her kindness, and also her wonderful Treasure chest cookies she baked,,, I was thinking of her the other day when I drove past her home in North Warren.My prayers will be with you at this time . I am going to miss my friend Char, she was an awesome person, Mom, Grandma, Great Grandma, Mother in law. She enjoyed every moment even the pain did not stop her. She loved feeding the world, having her 1 beer, fixing a sour stomach with a coca cola, watching the mets & browns, listening to 92.3 all day long hoping to hear a Tom Jones song, singing with Patty cake sitting beside her in the giant chair. My life is better because she was part of it. She is at peace, no longer in pain, but I am going to miss our conversations & her all around Sexiness. You are all in my prayers. So very sorry to hear of the loss of your Mother. My thoughts & prayers during your time of sorrow. I will never forget my “other” Mother growing up on Canton St. with all of you. The Joe Galbo Jr. family sends it sincere condolences and will keep Char and the family in our prayers. I had the pleasure of spending some time with Charlotte as a PCA with CRI. It was an honor to get to know her and Paddy. My sympathy goes out to the family….she loved you all so much!! God Bless!! !